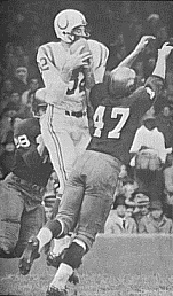 Berry didn’t have much opportunity to show off his pass receiving skills in college, catching just 33 passes and scoring one touchdown, but he was chosen as a future pick by the Colts in the 20th round of the 1954 NFL draft. He joined the team in ’55 and caught 13 passes as a rookie and, with the arrival of QB Johnny Unitas, improved to 37 receptions for 601 yards (16.2 avg.) in 1956. What he lacked in speed and heft he made up for with reliable hands and an excellent work ethic. Colts went 7-5 to finish third in the NFL Western Conference while leading the league in passing yards (2388) and touchdowns (41). Berry followed up by leading the NFL in pass receiving in each of the next three seasons, in pass receiving touchdowns in 1958 and ’59, and pass receiving yards in 1959 and ’60, despite being hindered by a leg injury in the latter year. He was a consensus first-team All-NFL selection after all three years and also had an outstanding performance in the 1958 NFL Championship overtime win over the Giants (12 catches, 178 yards, 1 TD). While he didn’t lead the league and missed two games due to injury in 1961, the steady Berry had a career-high 75 catches and was chosen to a fourth straight Pro Bowl. He went on to play a total of 13 seasons, all with the Colts, and retired as the career pass receiving leader at the time with 631, for 9275 yards (14.7 avg.) and 68 TDs. Berry was a consensus first-team All-NFL selection three times, received some first- or second-team honors after two other seasons, and was named to the Pro Bowl six times. He was selected to the 50th and 75th-year all-time NFL teams. The Colts retired his #82 and Berry was inducted into the Pro Football Hall of Fame, Class of 1973. Berry went on to a coaching career and was head coach of the New England Patriots when they won the AFC Championship in 1985.